Unsigned set of designer quality. 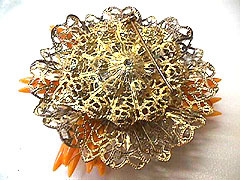 Large 2 1/2" diameter brooch features frosted orange "fruit" center surrounded by a variety of beaded ornaments, molded glass discs, glass tangerine "needlepoint clusters," rows of crystal beads -- all components are wired onto layered filigree backing. Clip earrings measure 1 1/4" (some darkening to the filigree backings on the earrings).